It`s pretty incredible to what extent some gearheads` creativity can go. We have seen many insane builds. Not matter the amount of insanity included, you always find new builds that seem to top the previous one which you thought were the most insane. 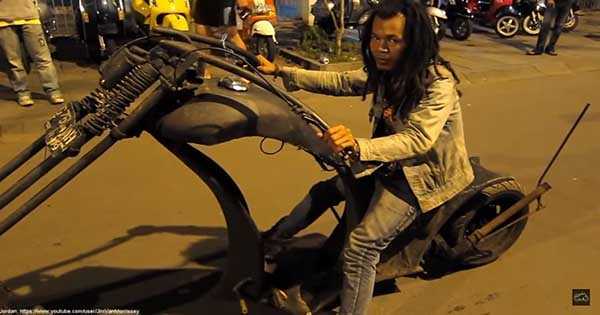 In this one, you`ll see an array of crazy motorcycles put in a compilation. The people who built these are definitely the mad scientists of the gearhead world. The first clip in this compilation of crazy motorcycles won`t disappoint you at all. It`s made in some Asian country and the bike looks like a caterpillar. It`s very long and runs on a huge amount of wheels. It also has designated space for transporting goods which his pretty awesome. Up next, you can see something for any music`s fan. It`s a motorcycle fully equipped with countless speakers. To make things even more insane it`s even fitted with hydraulics. If you are a chopper fan, you`ll see some insane chopper builds as well, like one chopper with an extremely tall front-end. However, you can also see some pretty advanced stuff here and definitely made on huge budget. We are talking Bruce Wayne money. We mentioned Bruce Wayne because one guy managed to build a perfect replica of the batmobile featured in Nolan`s Batman franchise. Pretty cool, huh? When it comes to advanced motorcycles, you can also see the Lazareth bike, built in France and is fitted with a V8 Aston Martin engine. For some, many of these crazy motorcycles are a collection of junk and deathtraps, but we call it passion. At last, check out the 16 crazy celebrities that ride motorbikes!